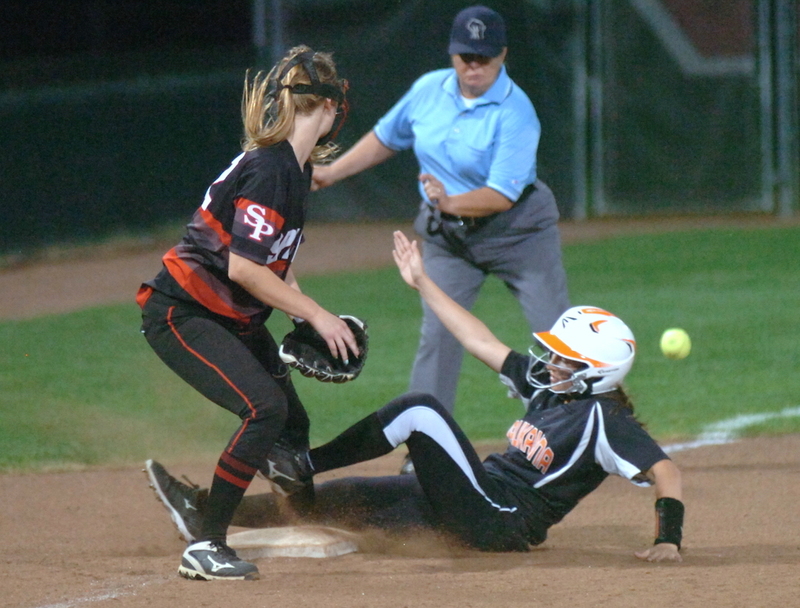 Kaukauna’s Ally Isselmann is safe at third during the Ghosts 3-0 state semifinal win June 9, 2017 over Stevens Point. Dan Plutchak/KCN photo. MADISON — Kaukauna’s ace pitcher Hailey Hestekin and catcher Michaela Meehl had a plan for the WIAA Division 1 state semifinal softball game. They would block out any distractions and play a simple game of pitch and catch. The strategy worked, leading the Galloping Ghosts to a 3-0 win over Stevens Point Area High School on Friday, June 9, 2017. They now will play Saturday evening, about 6:30 p.m., for a state title against Wilmot at Goodman Field on the University of Wisconsin-Madison campus. And the team is getting hot at just the right time. “It’s awesome. I think we’re all really having a lot of fun. We’re playing our best ball and peaking at the right time,” she said. Hestekin said she knew she had a no-hitter going into the seventh inning, but she shrugged it off after giving up a hit in the final inning. The Ghosts scored twice on two errors in the second inning, then added a final run in the fourth.